PM is also called Particulate Matter or particle pollution, which is a mixture of solid particles and liquid droplets present in the atmosphere. The particles present in the air are so minute that you cannot even view through naked eyes. Some particles are so small that they can only be detected by using electron microscope. Particle pollution consists of PM2.5 and PM10 which are very dangerous. 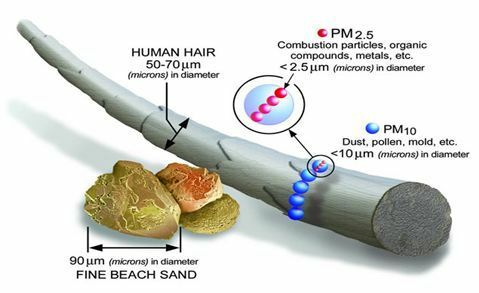 PM2.5 refers to the atmospheric particulate matter that has a diameter of less than 2.5 micrometres, which is about 3% of the diameter of human hair. The particles in PM2.5 category are so small that they can only be detected with the help of the electron microscope. These are smaller than PM10 particles. PM10 are the particles with a diameter of 10 micrometers and they are also called fine particles. An environmental expert says that PM10 is also known as respirable particulate matter. Particulate matter is a complex mixture of soot, smoke, metals, nitrates, sulphates, dust water and rubber etc. Do you know that PM10 and PM2.5 spread more due to dust, construction work and burning of wastes etc? Do you know that if the quantity of PM2.5 in the air is 60 and of PM10 is 100 then the air is considered safe for breathing? Particulate Matter is of different sizes and it can be due to both human and natural sources. Sources can be primary and secondary. The primary source includes automobile emissions, dust and cooking smoke. The secondary source of pollution can be due to complex reactions of chemicals like sulphur dioxide and nitrogen oxide. These particles are mixed in air and pollute it. Apart from these, forest fires, wood burning stoves, agricultural burning, smoke of the industry, dust occur from various construction sites also causes air pollution etc. What are the health effects of PM2.5 and PM10? Due to small in size both PM2.5 and PM10 particles act as gas. When you breathe, these particles they penetrate into the lungs, which can lead to cough and asthma attacks. High blood pressure, heart attack, stroke etc. serious diseases may occur and as a result of which premature death can occur. Do you know that if the level of PM2.5 is high in the air mist or fog increases and the visibility is affected? The worst effect of these particles in the air is on children and the elderly people. What is Carbon Fertilization and its effects on crop production? - Irregular heart beat etc. Who are at risk due to these particles? Everyone needs air to breathe, when we breathe this air we come in contact with the air pollution. One Research states that the risk of air pollution is higher in urban and industrial areas than in rural areas. Apart from this, exposure to air pollution is likely to affect children and senior citizens badly. People with heart and lung diseases can be more at risk to air pollution. - People should use masks to avoid air pollution and should consult a doctor if problem is severe. - Avoid exercising outside when the pollution level is high. - Do not burn wood or thrash because these particles are the main source of pollution. - Do not smoke at both indoor and outdoor places. - To keep your indoor space safe from air pollution, you can also use air purifier. Air purifier can reduce the rate of air pollution inside your home. - If air pollution lasts for several days, then change the place for some time. How much level of PM2.5 and PM10 should be there in the air? Normal level of PM10 should be 100 micrograms cubic metre and PM2.5 level should be 60 microgram cubic meter. As we know that the level of PM2.5 and PM10 in the air is increasing which is causing air pollution and on the other hand risk of diseases is also emerging day by day. So, we should take precautions like use mask etc. Next Story How much Tax you pay on Diesel & Petrol in India? 1542 Views What is Mission Shakti? 812 Views What does Low Earth Orbit (LEO) mean?